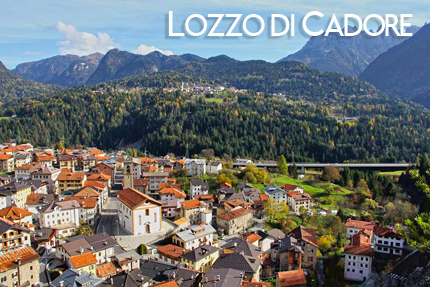 The town of Lozzo di Cadore is right in the heart of the Cadore valley, at the foot of the Marmarole massif. Its right to call itself 'the town of the mills' is undisputed and Rio Rin, the stream which runs along the side of the town, has always been its vital force. The power of its waters has been the driving energy behind a great many manufacturing activities: along the course of the “Roggia dei Mulini” many workshops once used as mills, forges and sawmills are still visible today. Along the streets and footpaths of the town information panels together make up the Museo Ladino Diffuso, the open air Ladin culture museum which illustrates the main agricultural activities of Ladin culture. Recently thoroughly renovated and re-styled Palazzo Pellegrini now hosts a conference room, the headquarters of the Alto Bellunese Local Action Group, the local library and its internet point and the Roggia dei Mulini Visitors' Centre. In addition to its interesting history and culture Lozzo's attractions include natural elements of great interest like the Sentiero Botanico Tita Poa - the Tito Poa Botanical Walk - an itinerary of around one and a half kilometres to the north of the town with its many native flora species. The Pian dei Buoihigh plateau is a natural jewel in the landscape. Situated on the slopes of the Marmarole massif it is a destination for a great many walkers and cyclists who enjoy some of the most impressive views in the Dolomites, including the Tre Cime di Lavaredo, from this veritable mountain terrace. There are also many traces from the Great War here on the plateau.